WELL. That was EXCITING! Although I think my common sense possibly drowned. 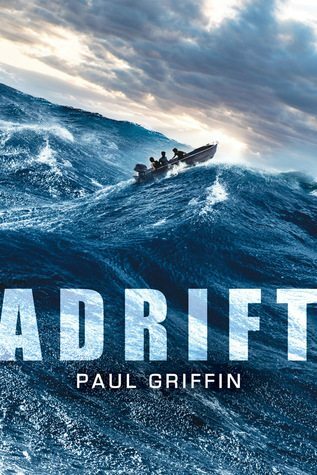 The premise is “5 teens, 1 boat, in the middle of the ocean” which is all well and good until you discover the reason they end up in that predicament. GAWSH. Humans are stupid. I was actually reading this whilst my 4yrs nephew bounced on my head, so I showed him the cover and said, “What do you think?” And he said, “It looks boring.” He’s going to be a harsh book reviewer when he grows up. Omg. I’m so proud. I don’t think it was boring, per se, but I felt emotionally uninvested. I am mostly a puddle of shrugs. But I am a puddle of desperation as well. I couldn’t put the book down. I HAD TO KNOW. So for addictiveness, it is wonderful. BUT LET’S BACK UP AND TALK ABOUT THE PREMISE. So! Two best friends, Matt (the narrator) and John are selling ice cream and stuff to save up for their futures, and they meet these Brazilians on holiday. Let us bounce to the part where Matt (dragging John) goes to a party [insert introvert partying awkwardly] and he really likes this girl Dri, and then OH NO! The rebel of the party throws a tantrum and runs out to windsurf at 2am. Matt (still dragging that poor John), Dri and her cousin JoJo aaaall run into a boat THAT THEY HAVE NOT CHECKED FOR FUEL OR ANYTHING and then toss themselves in the ocean. Least to say, it goes horribly wrong. I mean. DUH. Would you jump into a boat without checking the motor works?? I mean, come on. Despite cringeing at the “WHY WOULD YOU DO THAT” moments, I was quite interested in the characters. Matt was the “nice guy” and totally boring. John was like this silent, tortured kind of…possible sociopath? He seemed to have no emotion. Yay John! Dri seemed like the token nice-exotic-girl-you-meet-on-a-holiday-and-omg-instant-connection. JoJo was pretty normal until he was stuck stranded in a small boat in the middle of the ocean with no food/water/help/medication. Then he was — not nice. Stef spent like 80% of the book unconscious. Let’s say I probably wouldn’t share my last peanut to keep them alive. I’d eat it. By myself. I felt indifferent to a lot of the events because the writing just laid out what happened with no BAM. I need bams. I had to keep rereading because my attention wandered. It was a psychologically intriguing survival story. I drowned in the apathetic writing style, but maybe it’s just me who baulked at the writing. You’ll never know unless you READ IT. Mwahhaha ha ha. I’m also endlessly annoyed at the ending, but I think, although it was unsatisfactory, it was still realistic. I just wish the book had been narrated by the sociopath instead of Matt-the-dull-limpet. ALSO REMIND ME NEVER EVER TO GO SAILING IN CASE I GET STRANDED LIKE THIS. I need my food. I need my books. I don’t wanna consider cannibalism. THANK YOU TO TEXT PUBLISHING FOR THE REVIEW-COPY! 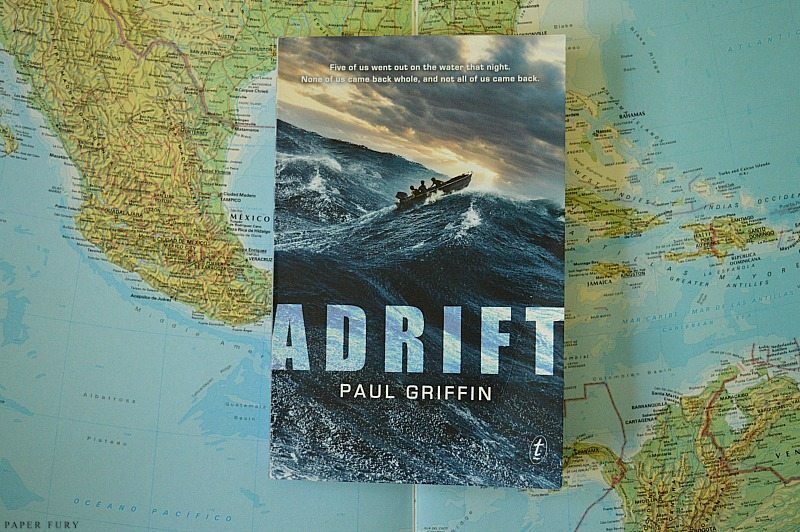 Adrift by Paul Griffin was published July, 2015. OKAY. TIME TO TALK. how long do you reckon you’d last on a boat with no food? what’s the likelihood of you turning cannibal? (serious question that.) ALSO. do you ever read survival stories?! what’s your favourite? How long could I survive in a boat with no food? At least half an hour to 45 minutes. I UNDERSTAND THIS ON A SPIRITUAL LEVEL. Okay, okay, when I think about it, I don’t think I’ve actually read that many survival novels. Like, I’ve obviously read novels where characters are trying to survive (pretty much the entirety of GoT haha) but never a novel directly focused on it. IN SAYING THAT, I love the TV show LOST. I think I’ve watched it beginning to end about six times. >.> So yes, I LOVE survival things. But put me in a situation like that? Yeaaaaaah. No way I’d go well. At all. I’d give it about ten minutes on a boat with no food before I started whining. I love the sound of the psychological elements of this, though. AH YES. I read tons of books where the characters are trying to survive their insane author all the things. Like the Hunger Games, too!! BUT SURVIVAL STORIES ARE SO FREAKISHLY GOOD. Did you ever see the Bear Gryllis TV show? I loved that when I was smallish. IT IS COOL. THOUGH. I’m just a tough marker. 😉 I like that I couldn’t put it down (because that is a really really good sign!) I just wish Matt hadn’t been such a boring piece of kelp. Oh injuries…. bad ones… you just totally put me off the book… that is one thing I just can’t handle…. yes I can survive battle scenes and all amount of happenings to characters that are not the main characters… but if it goes into any detail about their injuries…….. I don’t think I have read many survival stories….. but then you could argue that any adventure story is that… Hunger games…. if that is not survival what is! I don’t think I’d turn cannibal…. id probably be the one being eaten….. or being left behind reading and not even have gone on the adventure that ended such. REALLY?!! I love injuries. Omg. Wait. WAIT WAIT THAT SOUNDS SO BAD. XDD I just like realistic injuries and when things go wrong like that because…realism. It’s my favourite thing of ever. I think I mightn’t survive without food. That sounds just so hard. SO HARD. I need my food, okay? The other day I only had an apple until lunchtime, and by dinner I was so hungry I at 5 tacos. (They were good. Then I ate ice-cream and brownie and was very full, which made up for my lack earlier in the day.) This sounds interesting, but with all the drama and injuries you hinted at, it seems like some bam would be acceptable, right? And boring MCs are THE WORST. You’re making me crave tacos. xDD I love breakfast. Breakfast is life, tbh. AHHH BUT YES. Maybe I’m alone in feeling uninvested in the characters, but at least the addictive plot and “BUT WHO’S GONNA LIVE” questions kept me flipping pages. I LOVE CASTAWAY. Seriously. I cried over Wilson, I did. And that’s ridiculous but I’ll probably call my firstborn Wilson just in honour of this momentous moment of tears from my Vulcan soul OVER A VOLLEY BALL. Omg. I think I’ve read one survival story? That was the reason this caught my eye. It sounded interesting and like it would be unputdownable, which it sounds like it was. Just a shame you weren’t invested in the characters that much. Great review, Cait! Oooh this book is right up my alley. I’m gonna have to find it. 😀 Thanks for the review! Oh, gosh… I like my food. (Possibly a little too much!) I honestly have NO idea how long I would be able to last. I like to think that I would be able to survive & live to see the end, but I’d probably be the weakling who falls off the boat?? Food keeps us alive, of course we must like it. *cuddles a tomato* I think I would just cry myself dehydrated and die that way, unfortunately. I would like to THINK I am adventurous and hardy but, um, probably not. I LOVE SIGN OF THE BEAVER!! Omg, that brings back such memories. Did you ever read Moccasin Trail? I was in love with that one too and the survival aspects. Thank you for this review, although it has some intriguing aspects, I definitely will be avoiding this book like the plague. OMG. yoU ARE A PERSON I RELATE TO AN ASTRONOMICAL AMOUNT, THEN, WESAUN. Breakfast is my favourite meal of the day and I cannot survive without lunch. Lunch is LIFE. And I get very very cranky when I’m hungry. OH MY GOSH THE GONE SERIES IS MY FAVOURITE THING IN THE HISTORY OF THE UNIVERSE OF EVERRRR!! *flails* I’ve read all 6 books and Light absolutely made me bawl. I love Caine. I love Caine more than I should. OMGGGGGGGGG. I KNOW. CAINE. CAINE. IT WAS TERRIBLE. I can never go without lunch, EVER. I have read the whole series, all in one go, and I LOVED IT. IT IS SUCH A BRILLIANT PIECE OF GENIUSSSS. I AM SO GLAD WE RELATE AN ASTRONOMICAL AMOUNT. ALL THE HEARTS AND TACKLE HUGSSSS. CAINE IS JUST A MISUNDERSTOOD, LITTLE, UNLOVED PSYCHOPATH AND MY SOFT SPOT FOR HIM IS QUITE BOUNDLESS. *hangs head shame-but-not-really-shame* hehe I had to wait for Light to come out, but otherwise, I pretty much binge read the. BEST DECISION EVER. Weeeeeellll, I doubt I would ever turn cannibal–at least, I hope I wouldn’t. But it would also be difficult to starve to death. Still…. But yeah, these kids. *shakes head* I do think the psychological aspect sounds intriguing, and I’m always up for a sociopath. So I’ll have to think about this one. The tagline looks interesting… I think I can guess what that might mean. Starving to death would be the WORST I think. Also drowning. Also burning. Erghhhh. (I regularly have discussions with my sister on the worst ways to die.) I could handle freezing to death because I think you’d just go to sleep. AHEM. ANYWAY. 😉 Little rabbit trail there…Ohhh, the sociopath is awesome. I like how at one point it throws this idea out that 1 in every 10 people you meet is a sociopath (or something like those statistics). It really got me thinking and wondering if it was true. Basically what I have learned from various horror novels and Supernatural and whatever other horror stuff I have watched or read: Never go near the ocean, a lake, a river, a stream, a bathtub, a sink, a puddle, a waterfall, or anything that contains water because there might be a lake spirit waiting to drown you or a herd of kelpies or Sirens thirsting for flesh or something. And boat with no food…well, I know how to fish and I know there is fish that you can eat raw, so no food would be fine BECAUSE I WOULD FIND A WAY TO GET FOOD. It’s water that would be an issue. And I wouldn’t be able to get to the point of cannibalism because by that point I would either have to be without food for like a week and by that point I would be found or dead from dehydration or drowning. And even if I did manage to eat someone, there would be vomiting and one of those teenage girl freak outs because no way did I just eat someone. Yes. Yes exactly. Don’t go near water, or circuses for that matter, or into creepy alleys or suspicious small towns. BASICALLY GET THEE A BAT CAVE AND LIVE IN IT FOREVER. I don’t think I can handle realistic gore XD. I prefer my gore to be as far-fetched as possible so that I NEVER have to think about how I can get hurt that way too. I wouldn’t do well stranded ANYWHERE. I can maybe last half an hour before I start complaining how I haven’t eaten in the last half hour and when can I get some food around here. I’d probably drive myself batty in 5 minutes with only my thoughts to accompany me. HAAAA. Omg, this is not for you then. The injuries were SO REAL and freaky. *shudders* Reason #948120 why I’m never going boating. I could probably last a while without food. Water is another story. Trapped on a boat in the middle of the ocean means you’d have to resort to drinking pee… and I just don’t know if I could do that. Especially since it would be really strong due to the fact that you’d already be dehydrated. Yuck. I know I’ve read some survival stories, but I can’t really recall many at the moment. I know we read The Cay in elementary school. There was also some book called Lost in the Barrens. So many of the survival stories are about boys… Oh, wait! Nancy Farmer’s A Girl Named Disaster is a really good survival story. EEEEW. NO NO TO DRINKING PEE. They were collecting water in a tarp, somehow. It was legit, I Just forget the details. XD I’m very very glad you’re opposed to cannibalism though. (Although, tbh, no one in the comments has admitted to probably eating a human anyway. WE ARE ALL LOYAL TO OUR SPECIES APPARENTLY.) I loved the Cay!! I would be one of the first to die from lack of food, no question. I have a fast metabolism, and because I’m quite slim, if I don’t get enough food regularly enough, I have dizzy spells. My health would deteriorate rapidly. I do not wish to die, so I think I might consider cannibalism while freaking out and having a panic attack. Like, I might just throw myself at someone in a panicked frenzy and… I don’t like thinking about this. Haha! But I also know I don’t like food that isn’t cooked. I have my steak well done. No bloody please. So I would have issues with the cannibalism, like throwing up whatever I ate. As the weakest, I’d probably be killed, before I die of starvation, and eaten. THIS IS NOT A GOOD SCENARIO FOR ME TO BE IN! So not only does this book not sound like my bag, it now scares me too much to even consider. Survival stories have never really appealed to me. Though I do want to read Lord of the Flies, is that a survival story? Thanks for the awesome review, Cait! Leave it to Cait to prefer the opinion of sociopaths to someone who is actually nice. Also, google tells me that your name isn’t a real name. Wait. My name isn’t my real name??? My name is Cait! I SWEAR. Are you accusing Google of being a liar? Because I’m PRETTY SURE you’re much more likely to be a liar than google. The top three options are Cat, Cit, and Cast. I feel kinship to John. Oh John. :’) AHEM. I MEAN. NO. I AM A SUPER NICE PERSON WHO WOULD NOT SUGGEST EATING THE WEAKEST LINK IN THE GROUP. Nope. This sounds kind of interesting. I think it would be cooler if it was narrated by John the possible sociopath. Or dually narrated by him and Matt the boring. Because then you would see how outwardly cold John was, how other people perceive him, but still get to see what was really going on in his head. (This is why I love multiple POVs.) It sounds simultaneously riveting and boring. Well, not exactly boring, just slow moving. Because they have no place to GO. I’m used to fantasy. We quest everywhere. We swing swords. We do adventure stuff. Not sit in a boat and starve to death while considering cannibalism. Aaah. . . and the cannibalism. That’s really sick. I mean, obviously the book is going to talk about it considering the situation. But- that always makes me squeamish. It also makes things very, incredibly dark. (Like, have you ever seen Sweeney Todd? That’s dark. That’s disturbing. Just *shivers*) I’m not sure if my mind would turn to that if I was in that situation. I think my brain would be so dumb, that I’d hardly be able to consider anything. I’d probably go drown myself. 😛 Or the others would eat me first. Yeah. . . that’s probably more accurate. I’d be the first one eaten. Cait, it’s 10 at night and your disturbing me with talk of cannibalism and cardboard characters! Whyyy?! And which is more disturbing? *whispers* There's actually no cannibalism in the book, but they DO think about it. OMG I DON'T THINK I WOULD EAT A HUMAN. Although I was discussing this with my family and asked what the logistics of, say, cutting off your finger and eating it or something would be. BUT THEY YELLED AT ME AND FLED IN TERROR SO IDEK. I GUESS THAT WAS A NO? I’d like to think maybe the characters were all drunk because their decision was so stupid??? bUT IT DIDN’T APPEAR TO BE THAT WAY. The ocean is just a horrifying place, really. I mean, it’s nice to look at, and maybe dip your toes in, but…..its FULL of things (including many undiscovered things) that want to KILL YOU. I mean, there are sharks, and then there are things that EAT SHARKS. It’s got riptides and undercurrents that want to drag you out so far you can’t swim back, and drag you under with such force that you can’t get back up. It’s got waves that want to flip your boat upside down and tear it apart. And sometimes, the whole ocean decides it wants to try and come up on land, and then a village is lost and thousands of people are dead. …….I don’t like the ocean. This is in my TBR but I haven’t got to it yet. I would totally crack very fast. It’s the NOT KNOWING if you would survive. Like IF I knew I had “a week before rescue” I think I could do it. But indefinite amount of time?! MY BRAIN WOULD NOT BE OKAY. I’d probably be one of the ones eaten. LOL No way could I force human flesh down my throat. 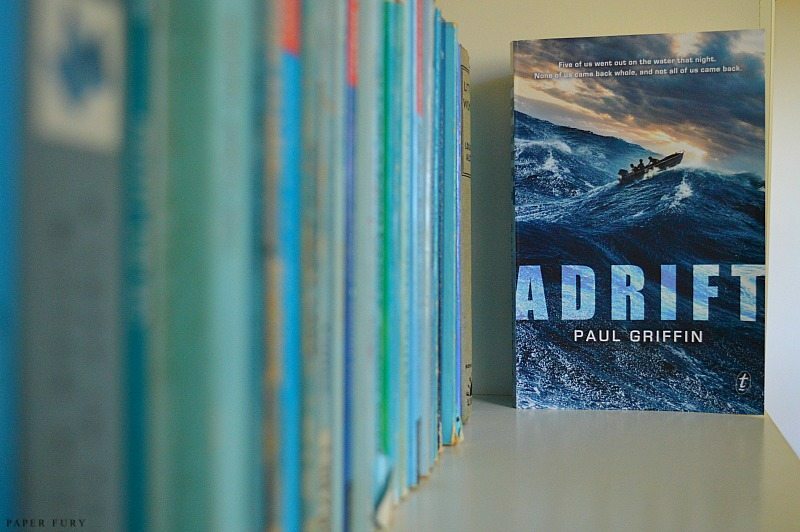 I like reading books about survival and watching movies too. Don’t have a favorite. They are shooting a remake about the Indianapolis here right now. That was such a tragic true story. All those men adrift in shark infested waters and no one knows they’re missing for days. Awk, I don’t even know that story but it SOUNDS awful. :O I love survival stories, but at the same time they’re uber stressful. I used to watch a lot of survival shows…there was one where they interviewed the survivor AND reenacted it and I loooved that one. SO FREAKY. I think my comment got eaten *pouts* So I’m posting again, sorry if it’s a double post! Firstly I love the first photo! The atlas and the book meshes in the cleverest way! My worst nightmare is to be stranded on a boat, as I suffer from terrible and gross seasickness. Last time I went snorkelling I almost begged to be left floating on the Great Barrier Reef rather than suffer a boat trip back to land. The only book of this type I’ve read is Life of Pi which I adored, but this one sounds interesting, too!! Atlases are LIFE I tell you. LIFE. And yes, yes, I feel you here, because I get motion sick on cars, so I can just imagine how I’d be a puddle of death on a boat. You went snorkling on the Great Barrier Reef?! OKAY THAT IS PRETTY COOL. I actually quite like survival stories. I actually kind of want to write one. This one is on my TBR, but this ending business has me wary. I also enjoy that you would let them starve and keep your food. That’s smart, really. How long would I survive? I mean, I would be cranky without food, BUT I’d be fine for at least a few months (I have extra padding). I would probably die of sunburn or nausea though, far sooner than from lack of food. And NOPE, I would not turn into a cannibal, I feel pretty confident saying that. I mean, I won’t eat anything if it has a hint of onion in it, I am certainly not eating something that has a hint of human in it! I’m all for self-preservation first, Shannon. I’M VERY HONEST, AREN’T I? I would die of nausea to though, because erghhh. I get motion-sick in a car, so a boat would be the end of me. I DON’T KNOW. I THINK YOU SHOULD READ IT. Because at least I can comfort you through the growling ending, and there are some startling character developments. *whispers* No cannibalism tho, I PROMISE. Well I’m glad it’s not boring but actually filled with excitement! I really do like the survival/psychological aspects. But the characters sound kind of bland/one-dimensional. Thanks for the review Cait! At least I know what to expect now. I LOVE survival stories, they are definitely my kind of scary books. (Also, your nephew is hilarious.) Though it does seem like authors always try yet fail with the characters in these type of books. But a really good survival story that I recently read, The Islands at the End of the World by Austin Aslan, packed quite the desperate survival punch but with a side serving of *actually* caring about the characters. I actually shed a tear. Plus, add a spoonful of Hawaiian mythology and a dash of sic-fi elements and IT WAS MARVELOUS. My nephew has started critiquing all my book choices, particularly at the library. “No, Cait,” he goes, “That looks too scary.” XDXD SO ADORABLE. He approves of my comic addiction though. hehe. OH I MUST LOOK UP THIS ISLANDS AT THE END OF THE WORLD THEN. I have such love for survival stories! YES THE PSYCHOLOGICAL ASPECTS!!! Most fascinating thing in the story. Along with the gory, festering injuries. Everything else I didn’t particularly care about haha. I feel like I could survive in a TON of situations because of books. OKAY, WELL. I’D LIKE TO THINK I COULD. But lets face it, I’d be just a bawling mess because I wouldn’t be able to read. Like seriously stuck on a raft for 2 weeks with no books?! ULTIMATE TORTURE.